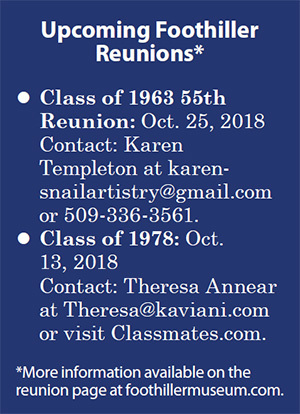 Since 1921, with the graduation of its first senior class, Grossmont High School alumni have returned to their school to show their gratitude. 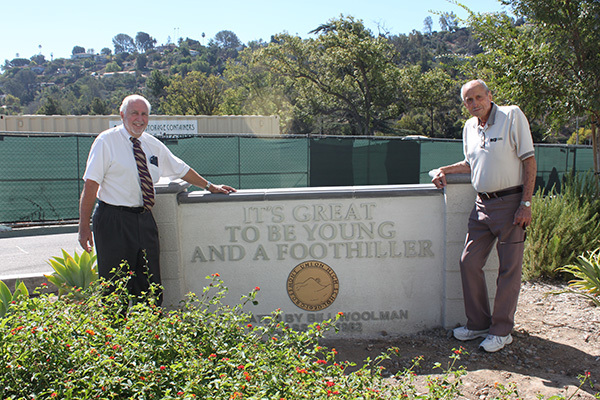 Today, we have two generous alumni leaving their footprints on Grossmont’s physical campus: Gene Chubb, Class of 1948, and Bill Woolman, Class of 1962. In 2012, Woolman funded the creation of a two-sided, gray-columned monument in front of the 2013 Humanities Building on the east side of campus. Woolman’s vision was for a sign that celebrated Grossmont High. The sign’s front side proudly proclaims, “Grossmont High School, Established 1920.” The back side affirms, “Foothillers Forever.” The style of the monument echoes the original gray “castle” seen across the lower and uppers quads. For five years, it has been a favored spot for photographs on campus. Woolman and Chubb’s first project together was the restoration of the Big G on the Hill below the original school, which has been in that location since the 1940s when it was first made of blue and gold blooming shrubs planted by the Hi-Y Club, of which, not surprisingly, Chubb was a member. Then, in 1993, thanks to Chubb’s generosity as co-owner of RCP Brick and Block, the big “G” we now see on the hill in front of the original granite “castle” was created from 770 gold painted bricks and gravel by crews of parents and band members over nine Saturdays. In 2016, the big “G” was again showing its age and was renovated this time due to the generosity of both Chubb and Woolman. With Chubb donating the materials and Woolman funding the installation, the “G” was repaired and painted, the frame of the “G” redone in stone to match the 1922 granite of the original school, and the gravel replenished! The Big G on the Hill is now a beautiful symbol of the original granite school visible above it. Located at the front of the school near the senior lawn is a sign donated 30 years ago by a senior class. In 2016, it was also showing its age with its red brick pillars and the illegibility of the face of the sign. Again, Chubb came to the rescue by donating the concrete block and materials as well as the mason’s labor to renovate the pillars and the face of the sign. The historic face of the sign, lettering, and image of our mascot “Grossmont Gus” were also replaced thanks to a generous donation to the GHS Educational Foundation from the Gerald Fackler Charitable Remainder Trust. Most students and staff on campus tolerated the muddy shoes and footprints caused by a pathway adjacent to the Math Building that flooded during irrigation or rain. However, in 2017, looking for another project, Woolman and Chubb again joined forces to create a pathway out of gray pavers and gravel, with Chubb donating the materials and Woolman funding the labor for a landscaper to create the pathway, much to the delight of the teachers and students in the Math Building. Visit the GHS Museum on Wednesdays: noon-3:30 p.m. Oct. 3 or Saturday, Oct. 27 from 10 a.m.-noon or by appointment on other Wednesdays. To learn more about Foothiller history, visit foothillermuseum.com, email ghsmuseum@guhsd.net or call 619-668-6140.